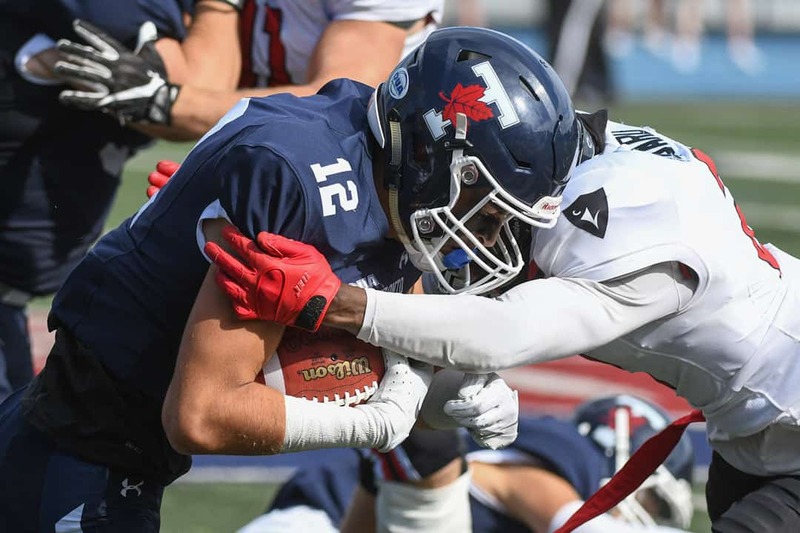 The Varsity Blues entered Saturday’s game looking for their first win against the 3–1 Carleton Ravens. After being hired away from Queen’s University in the offseason, Blues head coach Greg Marshall was in search of his first win against the team that defeated Toronto 43–0 last season. Early in the first quarter, Blues special team player Javen May forced a fumble from Ravens wide receiver Quinton Soares, but it resulted in a scoreless drive. The Blues were the first team on the scoreboard after Ethan Shafer converted a 37-yard field goal shortly after Clay Sequeira’s spectacular 51-yard pass to Will Corby with just over six minutes left in the first quarter. The Ravens immediately answered back with a 40-yard field goal of their own. The Ravens opened the second quarter with two big plays, including a 60-yard screen to tailback Nathan Carter. With poor field positioning in their next drive, the Ravens conceded a safety. After a 15-yard facemask penalty from the Ravens, the Blues were on the Ravens three-yard line with Connor Ennis subbed in at quarterback. Two Ravens offsides and a Blues procedure saw Sequeira subbed back in to throw a dime in traffic to Nolan Lovegrove for a touchdown. The Blues took a 12–10 lead. Late in the second quarter, Sequeira needled another tight pass to his favourite target of the game, Lovegrove — but it led to a missed field goal that was taken to the Ravens five-yard line. After a forced fumble, Blues receiver Daniel Diodati scored a quick touchdown with a five-yard rush. By halftime, the Blues continued leading 19–10. After a few scoreless drives, running back Mathieu Pickens scored a two-yard rushing touchdown for the Ravens with 10 minutes left in the third quarter. The Blues offense gave up a quick sack that resulted in a safety, tying the game at 19–19. With little more than two minutes remaining in the third quarter, Soares caught a deep pass and ran it in with the Ravens taking the lead at 26–19. With less than four minutes left, the Ravens finished the quarter with a successful drive and field goal. The Blues offense refused to show up in the second half, beginning the fourth quarter with an interception that gave the Ravens possession. After two missed opportunities, the Ravens scored another field goal. The Blues finally woke up almost six minutes into the final quarter as Diodati scored on a 99-yard punt return for a touchdown. The Ravens answered back with a quick field goal after a forced fumble. With seven seconds left in the game, the Ravens scored a final field goal, winning the game 38–26. Editor’s Note (September 25): A previous version of this article incorrectly stated that the Varsity Blues hired Greg Marshall from Western University, when in fact the Blues hired him from Queen’s University.